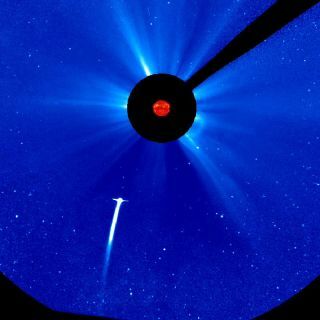 SoHo and STEREO spacecraft continue to watch Comet Lovejoy as it moves closer to the Sun and brightens. This still shows the comet headed towards the Sun, December 15, 2011. UPDATE! Comet Lovejoy has survived its fiery plunge through the sun's atmosphere. Read the full story here. This story was updated at 6:46 p.m. ET. A new comet, part of a comet family with paths that fly within a hairsbreadth of the sun, will be making its closest approach to the sun later today (Dec. 15). Comet Lovejoy is en route toward what most astronomers believe will be its ultimate destruction: arriving at its perihelion — its closest approach to our star — at around 7 p.m. EST (0000 GMT on Dec. 16). At that point, the comet should be a scant 87,000 miles (140,000 kilometers) from the solar photosphere. Since it will be passing through the sun's intensely hot corona, where temperatures of up to 2 million degrees Fahrenheit (1.1 million degrees Celsius) have been measured, the comet is not expected to survive, likely being completely consumed by the extreme heat. So what if comet Lovejoy survives? On that very small possibility, there is a very slim chance that observers might catch sight of it in broad daylight. Sungrazing comets are known Kreutz comets, after the 19th century astronomer Heinrich Kreutz who first showed that they were related. Such comets have, in the past, briefly flared into extreme brilliance around the time of their closest approach to the sun. In 1843, 1882 and 1965 such occurrences took place. More recently, in 2007, the sungrazing comet McNaught became bright enough to be seen in the daytime; all one had to do was block out the sun with a hand or behind a building, and the head of the comet was visible as a bright speck of light against the blue daytime sky. "If comet Lovejoy gets as bright as magnitude -4 or -5, there is a tiny but non-zero chance that it could become visible in the sky next to the sun," said comet researcher Karl Battams of the Naval Research Lab in Washington, D.C. Astronomers measure the brightness of objects in space on a magnitude scale in which lower number magnitudes correspond to brighter objects. While Lovejoy will reach its brightest stage around the time it's sweeping closest to the sun, it will be so close to the blindingly bright disc of the sun that there is a very real danger that inexperienced observers using binoculars or telescopes to locate the comet could accidentally end up getting a quick glance at the sun and wreck their eyesight for a long time, if not forever. Thus, searching for Lovejoy is definitely not recommended around that time. But on Friday morning, there is a chance — albeit a very small chance, since it will be dependent on Lovejoy surviving its fiery brush with the sun — that it might show itself around sunrise. From North America, depending on your location, the comet will rise approximately 5 to 10 minutes before sunrise and will be situated to the upper right of the sun. If it is still intact, and shining as bright as, or brighter than Venus, then there is a chance that the comet might be visible. After the sun comes up, you might still try to see the comet, but again, use extreme caution. Try to block the rising sun behind a distant building and concentrate on the part of the sky about 3 to 4 degrees above and to its right (your clenched fist held at arm's length is equal to roughly 10 degrees). IMPORTANT WARNING: Do not point binoculars or a telescope directly at the sun! Severe eye damage can result. The betting money is that you won't see anything. Comet Lovejoy will likely either be too faint, or will have completely disintegrated after its suicidal plunge near the sun hours earlier.